The Baron Son continues to change lives around the world with the latest releases in Polish, Portuguese, Russian, Korean and Indonesian. Discover the business and wealth-building secrets of the world's most successful people. 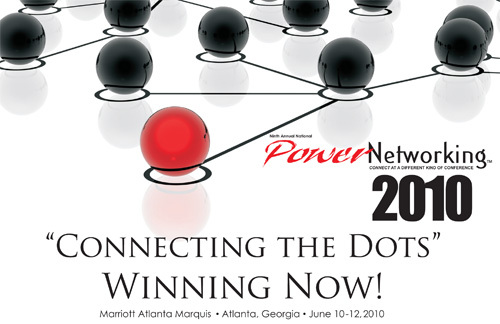 I wanted to share with you some FREE wealth-building gifts and highlights from my workshops at the 2010 PowerNetworking Conference in Atlanta - "The Wealth Mindset and Strategies that Create Millions" and "How to Start and Run Your Nonprofit Organization." As I thought about the tremendous value that participants got from the event, it prompted me to conduct a survey as to why more people do not attend networking events and conferences. My research revealed five common answers which became the basis for The Baron Insight for this week. They do not think the event will produce a sufficient return on investment. They do not feel comfortable networking or know how to properly network. They have not identified their value or do not know how to communicate their value to others. They do not have enough free time to attend. If so, below are some quick tips for overcoming these obstacles and quickly networking your way to wealth and business success. If there are key people that you want to meet at an event, contact them ahead of time and schedule a 10-15 minute introduction, 30-minute meeting, or a lunch or dinner with them during the event. This will ensure that you achieve your desired ROI. If money is an issue, partner with others to cover the cost of the event. You can provide value for them by taking their business cards and marketing collateral and networking on their behalf. If you do not feel comfortable networking, an etiquette or networking coach can help you develop greater skills in this area. When weighing the cost of hiring a coach, keep in mind, the right relationship can be worth millions of dollars to you. If you have not identified your value, working with a BARON Business Coach can help you raise your profile and create assets, income and media opportunities that would be of value to people of influence. If you do not have have the time to attend a networking event, you can send others in your stead. However, realize 80% of your success will be the result of soft skills-your ability to network, form mentoring relationships, strategic partnerships and joint ventures. Make an effort to attend at least five major networking events and conferences a year. Most importantly, follow up and build relationships with the people you meet. It will pay huge dividends. The fastest way to increase your income is to change the people with whom you spend the majority of your time. P.S. You also have my full permission to forward this newsletter on to people that you think may benefit from the resources and information. "The Income and Branding Power of Video Marketing"
The Baron Solution Group is widely acknowledged as one of the top business coaching firms for marketing, branding and business development. Not only have our strategies helped many of our clients to triple their website traffic and revenues, but as a byproduct, we have also helped some of our clients' advertisers to do the same. As you may have noticed, The Baron Solution Group is doing a lot more with our clients on the television and video marketing side, including executive producing an upcoming reality series to transform the lives of 10 women with Polycystic Ovarian Syndrome called PCOS Challenge®. Recently, we've helped a number of our clients to achieve record results in their businesses all because of the power of television and video marketing. Less competitive and easier to dominate. A strong brand helps increase customer loyalty, prevents your products and services from being perceived as a commodity, opens distribution channels, creates opportunities for free advertising, and will help you sell your business at a higher price. Short term, effective video marketing can mean: up to a 400% increase in revenue; the difference between 1,000 people knowing about your business and 100,000; having those 100,000 people who know about your business also develop a more favorable opinion of your business relative to your competitors and referring more people to you. If you are not using video marketing (and doing it well), you are missing out on a significant increase in sales, likely working harder than necessary to generate and convert leads, and are operating at a huge competitive disadvantage. Check out the Grace and Charm, Black Legends Series, and MAP University videos. Increase sales and brand awareness for your company, product or book with BARON Video Production Services. "Think Like a Black Belt silences the inner voice of self-doubt and provides you with the confidence, wisdom and tools to know that you can handle yourself in any situation. From corporate executive to professional athlete, if you've ever wanted to do more or to become more, this is the book that will help you realize your greatness." Receive over $500 in free gifts from experts, professionals and other best-selling authors. Investors and Nonprofits Increase Their Income. Now, Let Us Help You! "I learned how to generate an additional $30,000 in income yearly in my first few coaching sessions. It pays to invest in education. I knew where I wanted to take my business, but I just wasn't sure how to get there. Before starting the BARON Business Coaching Program, I was frustrated and spending lots of money unnecessarily. William gave me a road map to profitability. It made things so much faster and easier. The principles in the BARON Coaching Program work regardless of the industry or business." "In my first coaching session, William helped me automate my business and save over $2,000 and hundreds of hours of work. With his expert guidance and accelerators, in less than a year, I had my company formed, three income producing websites with over 5,000 members, a radio show and television show to promote my cause. William's advice has helped me secure tens-of-thousands of dollars in corporate sponsorship. One of the program's accelerators was a letter that helped me secure a four-figure corporate sponsorship deal in 15 minutes. BARON Coaching is by far the best investment I have ever made. I will always use William as my business coach and advisor." "Thanks to William and The Baron Solution Group's media communications mastery, we were able to launch a very successful, high profile public relations campaign that brought valuable exposure to Acresh's participation in a $1 billion deal to redevelop 23 acres of government-owned land along the Washington Channel in the nation's capitol. The BARON Business Coaching Program is phenomenal and always generates a clear return on investment." "The Baron Coaching Program has done a lot for me and I am extremely grateful. In our first coaching session, William helped me identify ten new streams of income to triple my revenues in less than a year. The strategies he shared got my businesses featured on CNBC, Forbes, Reuters and the front page of the "Business and Finance" section of my local paper, The Cape Cod Times. His strategies also enabled me to partner with over 15 celebrities and top business leaders to help promote my products. In addition, the accelerators in the coaching program saved me over $5,000. Some years ago, when I put together an executive summary and a business plan, I had an idea for a brand, but I wasn't clear on how any of that was going to be possible. Today, I look at my business and here it is. My dream has come true. I thank William and the BARON Coaching Program for making it all happen. There are not enough words for me to express my gratitude." "William helped me finalize a deal with a production company to co-host a new television show spotlighting entrepreneurs. Many of the ideas I pitched were possible because of William's guidance and The Baron Solution business model. In the first session alone, the advice he gave me landed me a spot on a series of conference calls for financial advisors with a major seminar marketing firm as well as helped me become a featured speaker on an upcoming cruise. He always goes above and beyond. William is a great mentor and friend!" "With the things William shared, we'll be able to sell more with our new CD in a few months than we've sold with all of our other CDs over the last 7-8 years. He delivers outstanding value through the coaching program and audio training. They are rich with relevant information, and William is a man of unbelievable insight." "Thanks to William, I have been able to launch my new television show and support network for children with brain cancer. He showed me how to find everything I needed including local organizations, doctors and coordinators that would support my cause. The accountability the program provided was just what I need to take action on my dream and create a lasting legacy for my father who passed away from cancer. In the midst of many distractions, the BARON Business Coaching program lifted my spirits and kept me focused on my goals." "The BARON Coaching Program helped me to step outside of my comfort zone, maximize my value to others and accomplish so much. Wow, what a difference having a coach made!" "Two of the most valuable things I took away from the BARON Wealth Coaching Program were how to structure my business so that it would make money and how to raise funds. I wanted to use my business concept to help others, but the one question I had was, 'Will there be a sufficient income stream?' That's what I couldn't figure out. The BARON Coaching Program helped me quickly develop a viable business model and monetize my ideas. The tangible checklists saved a lot of time and were extremely helpful. The program was also perfect for keeping me on track and holding me accountable to my dream." "The BARON Coaching Program was timely and a great investment. The tools, resources, and scripts alone saved me hundreds of hours of work and several thousand dollars. William helped me avoid making a lot time-consuming and costly mistakes. He provided the proper foundation to start the right way from the ground up. The BARON Coaching Program is a definite must for any author or consultant serious about their financial success." "We came to The Baron Solution Group to help us optimize our business systems and increase the ROI of our marketing activities. The coaching solutions William brought were exactly what we needed and far exceeded my expectations. The Baron Solution strategies on branding, positioning and education based marketing were brilliant. As a social entrepreneur with companies in India and the UK, I have found William's insights for global markets to be invaluable for attracting more business and bringing greater support to an important cause." "I needed the right action plan for buying a business. The BARON Coaching Program directed my focus on the highest ROI activities and helped me to leverage untapped resources, business credit, and strategic partnerships to buy businesses using other people's money. Great value!" 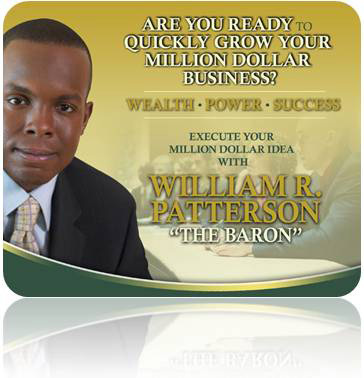 Leverage #1 Wealth Coach William R. Patterson to help you quickly start or improve the profits of your business. We are so confident that the BARON Wealth and Business Coaching Programs will help you increase your income that we offer a NO RISK $1,000 Product and 100% Money-Back Guarantee. If after your first coaching session, you don't believe the BARON Coaching Program will help you generate more income and grow your business, we will give a 100% refund plus allow you to keep over $1,000 in BARON Wealth and Business Training CDs for free. PNC Workshops: "The Wealth Mindset and Strategies that Create Millions" and "How to Start and Run Your Nonprofit Organization"
Official PowerNetworking Wealth and Business Coach William R. Patterson reveals the new mindset and strategies needed to create millions in today's economy and how to grow successful non-profit organizations. Learn how to accelerate your path to financial independence and nonprofit success. Save yourself years of wasted time with the BARON accelerated strategies for wealth and nonprofit success. "How to Turn Your Product Line Into a Fortune"
Most people are sitting on an untapped goldmine and don't even know it. Using The Baron Solution™ turnkey approach, anyone can learn how to create a profitable product line from scratch. You will discover step-by-step how to get started, what products to sell, how to package your offerings for maximum profit, and the best places and strategies for marketing your products online and offline. No matter if you are an information marketer selling downloadable products or a traditional retailer selling physical goods, you will discover highly-effective ways to increase sales and boost your profits. William runs over 30 websites and has created more than 150 products. He is winner of over ten web awards for excellence including Best Business Advice Site and Best Wealth-Building Site. Get started immediately with ten low-cost strategies for developing your own product line. Determine the ideal product combination for your audience. Turn your product line into residual income streams. Triple your income by creating a multiple purpose for your products. Implement the seven critical elements of a "cash flow" generating website. 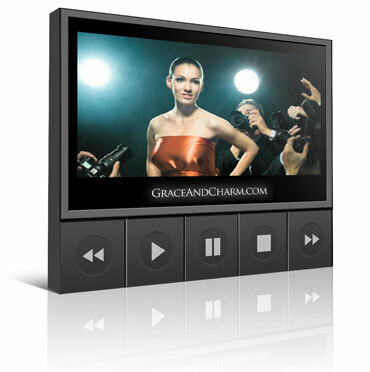 Sell more products using irresistible offers and multimedia campaigns. Double your income with the right branding and positioning. Dominate your market niche and increase your credibility and celebrity status. Get other people to promote your products and services for free. Cost-effectively distribute your products online and offline. For many parents and students, the cost of higher-education has become increasingly difficult to manage. According to the College Board, tuition and fees at public colleges and universities have increased 51 percent on an inflation-adjusted basis over the last 10 years. Here's a quick overview of some of the funding and saving options that can help ease the burden of higher education costs. Get your free report with best-kept secrets of how to get the maximum money for your child's college education. Today Declare Your Financial Independence! Invest in yourself and make 2014 your best year ever! For those who are serious about attaining financial success as authors, we've put together a very special offer, The BARON Ultimate Author's Wealth- Building Bundle.